In this movie, Williams owned the role of gay dad and Miami nightclub impresario Armand Goldman, who has to play it straight for one night to help his newly engaged son. Mike Nichols and Elaine May’s adaptation of “La Cage aux Folles,” about a gay nightclub owner (Williams) and his partner (Nathan Lane) who have to pretend to be straight when his son becomes engaged to the daughter of a conservative politician, is a surprisingly sly move. You think at first that it’s going to be a potentially offensive movie that overdoes the flamboyance, that’s all about mocking the broad affectations of gayness. But watch the performances, particularly Williams’, closely: This movie is as much about the affectations of straightness and the flamboyance of macho, about the fact that the concept of a “real man” is just as much a performance as anything else. 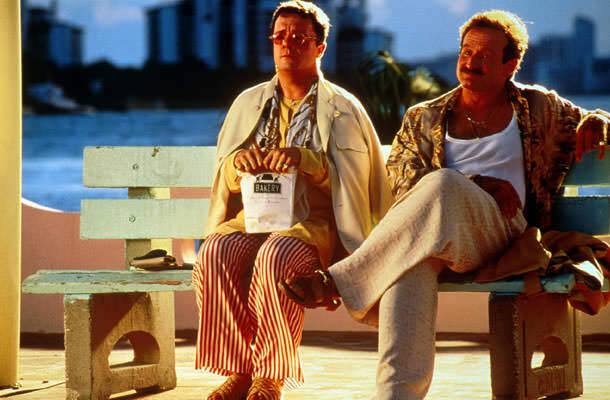 “The Birdcage” is the first time Mike Nichols and Elaine May, who helped define improvisational comedy in the 1950s, have worked together on a movie.